HENDRICK CONSTRUCTION STARTS THREE MAJOR PROJECTS FOR PROVIDENCE DAY SCHOOL | Hendrick Construction, Inc.
Charlotte, N.C., July 1, 2016 … Hendrick Construction has started construction on three major projects for Providence Day School. The four-story, 80,000-square-foot Academic Center, the 7,200 Gateway Center, and a 200-car parking deck are all anticipated to be complete in fall, 2017. Located at the heart of campus, the Academic Center will feature 35 classrooms, a lecture theater, collaborative learning center, a global café and a new school store. The building has been designed with input from Providence Day faculty and students to encourage an interactive, collaborative approach to learning, inspire innovative thinking, and significantly improve pace of life for students and teachers. The new “front door” to the school, the Gateway Center will serve as a welcome center for the campus. 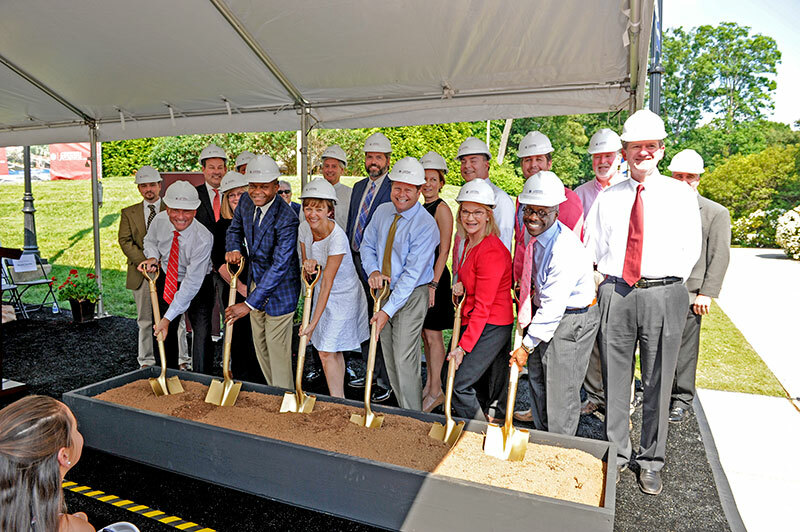 It will house both the Admissions and College Guidance offices, creating the opportunity for students and families to begin and end their Providence Day School journey in the same location. A two-story deck will provide 200 parking spaces in front of the Gateway Center. The enhanced parking will increase student and pedestrian safety by reducing vehicular traffic through campus. The Academic Center, Campus Gateway building, and parking deck were designed by respected local architectural firm WGM Design, Inc. WONDER, by Design, a multidisciplinary team specializing in the “future of learning,” was a collaborator with the school and WGM Design on many of the innovative learning spaces within the Academic Center. The new facilities are being funded through the $27 million Charging Forward fundraising campaign that began three years ago. Providence Day School officials report that more than $19 million has been raised so far. In addition to these major construction projects, school officials will use the campaign funds to double the school’s endowment and grow the Annual Fund, which supplements each year’s operating budget by supporting student programs, campus resources, and faculty professional development. Founded in 1970, Providence Day School is an independent, college preparatory school located on a 45-acre campus in Charlotte, NC. Providence Day was the first school in the nation to offer a separate Global Studies Diploma, and continues to be a leader in global education. Through an intentional TK-12 global curriculum, the school helps students develop into empathetic problem-solvers committed to creating positive change in their communities. More at ProvidenceDay.org. "In my more than 40 years of experience with construction projects, I have rarely had the good fortune to work with such a conscientious and dedicated general contractor. Hendrick Constructions’ team was enthusiastically committed to our project from the first day, and subcontractors were managed superbly. We recommend Hendrick Construction to future clients without hesitation."